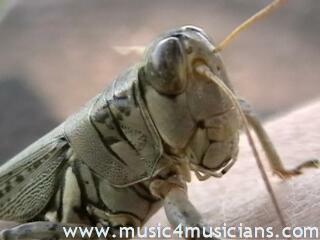 Grasshoppers can communicate! This video was filmed in Central Texas. 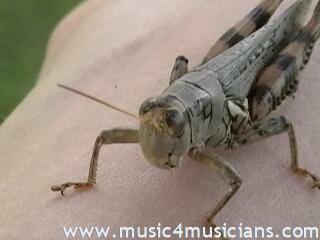 Grasshoppers are herbivorous insects. Females are normally larger than males, with short ovipositors, which they use to force a burrow in the earth to receive eggs. They can hop, walk and fly. Many male grasshoppers make a noise by rubbing their back legs together. There are at least 10,000 different species of grasshoppers. The long hind legs are used for hopping and they can leap as much as 20 times the length of their body. The shorter front legs are used to hold prey and to walk. They have 5 eyes and no ears, but hear with an organ called tympanum. For high speed connections, here's a file that plays on Windows Media Player in 640 x 480 size.